Peace has been restored to the Emerald Empire of Rokugan, but how long will it last? In the distant Colonies, the expansion lands born in the ashes of an extinct nation, the forces of ambition and greed remain very powerful, and can drive even the noblest samurai to a wicked path. The Divine Empress’s reign over the Emerald Empire cannot endure forever, and only one of her two sons – Seiken or Shibatsu – will succeed her. Will the honor of the Great Clans prove strong enough to overcome the temptations of Imperial politics when the time comes for her heir to be declared, or is civil war the only possible outcome? You are the hero. The choice is yours! 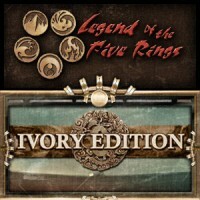 Ivory Edition is the latest base set for the fan favorite Legend of the Five Rings. Featuring booster packs and Clan starter decks, it is the ideal point of entry in the only CCG whose history has been shaped by its community for 19 years and counting. Grab your deck and bear proudly the colors of one of the 9 clans of the Emerald Empire as you try and improve its standing in Rokugan. Perfect time for players to start their L5R experience. Streamlined rules for ease of learning, while maintaining the deep level of strategy and tactics unique to L5R. Special focus on the draft environment. Add a Review for "Legend of the Five Rings – Ivory Edition"
L5R Ivory Edition card previews – Alliance and Fall Back!